carved in three-quarter relief with delicate features and pious expression, the eyes half-closed under arched brows joined at the bridge of the angular nose, the mouth with pursed lips and the ears with long lobes, the hair neatly coiffed behind a high diadem carved with flowers and foliate ornamentation, showing traces of original pale green pigment remaining in the recessed lines of the crown, the characteristic stone of pale grayish-buff color. The present head comes from one of the bodhisattvas standing in a niche flanking a seated Buddha in Cave XVI of the Buddhist Cave Temples at Tianlongshan. (天龍山) at Taiyuan, Shanxi Province. The site now referred to as Cave XVI at Tianlongshan originally contained six bodhisattva figures in three large niches each framing an identical arrangement of five figures: comprised of a large seated Buddha in the center flanked by a monk and a bodhisattva standing on each side, all carved out of the rock wall of the cave. Photographs of the three niches in Cave XVI showing all the sculptures in situ are published by Sirén in Chinese Sculpture from the Fifth to the Fourteenth Century, London, 1925, Vol. III, pls. 225-227. The heads of the figures were removed in the 1930’s. The style of carving, particularly the facial features and elaborate foliate crown of this bodhisattva head, are all distinctly characteristic of the sculptures from Cave XVI at Tianlongshan. Three very similar bodhisattva heads are illustrated by Vanderstappen and Rhie, ‘The Sculpture of T’ien Lung Shan: Reconstruction and Dating’ in Artibus Asiae, Volume XXVII, 1965, figs. 43, 47, and 49a, recorded as formerly Yamanaka Collection. The authors also publish early photographs of Cave XVI with the sculptures intact and identify the three Yamanaka Collection heads as from bodhisattvas standing at the proper left side of the Buddhas in the north, east, and west niches of Cave XVI. Another bodhisattva head now in the Osaka Municipal Museum is illustrated in Chūgoku no sekibutsu: sōgonnaru inori (Chinese Buddhist Stone Sculpture: Veneration of the Sublime), Osaka, 1995, p. 48, no. 29, identified as the bodhisattva standing at the proper right side of the Buddha in the niche on the north wall of Cave XVI. 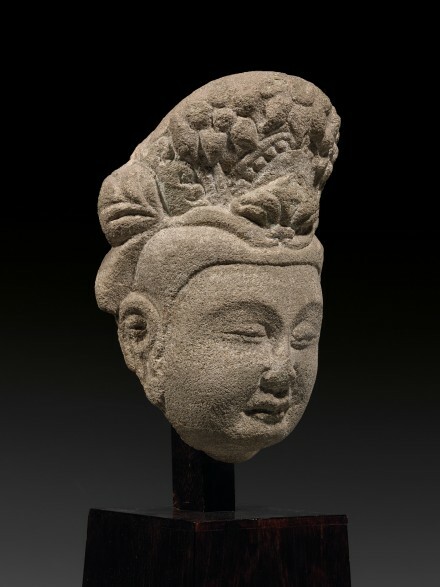 One other bodhisattva head from Tianlongshan Cave XVI, formerly in the collection of Edgar Worch, Berlin, is illustrated in the catalogue of an exhibition in New York by Eskenazi Ltd., Chinese Sculpture and Works of Art, March 2008, pp. 18-19, no. 4. The present head is the sixth bodhisattva head from Cave XVI at Tianlongshan.